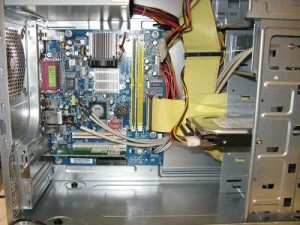 The image below shows an IDE PATA hard disk drive (the IDE type is now mostly replaced by SATA hard and optical DVD/Blu-ray drives, but still being used in millions of computers) installed in a 5.25-inch drive bay of a PC case. IDE hard disk and CD/DVD drives were still available brand new in June 2014. If you have a computer that can only connect IDE drives via its motherboard, you can purchase a PCI or PCI Express SATA adapter card that allows the installation of SATA drives. 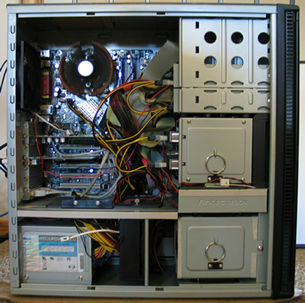 The black, yellow and red wires, connected to the hard disk drive’s power input port by a white Molex power connector, come from the computer’s power supply unit, the bottom of which can be seen in the top left of the image where the coloured wiring is collected together at the point at which it enters the power supply, bound by an elastic band. The large yellowish ribbon cable is the drive’s IDE data cable, which is connected to the motherboard (the large printed circuit board attached to the back of the case) and to the drive itself. SATA drives are connected to the motherboard in the same way but each cable can only be attached to a single drive (most IDE cables can accommodate a combination of two IDE hard-drives or CD/DVD drives in a master/slave or Cable Select configuration). Most motherboards provide six SATA numbered connection ports. The number determines the boot order of the drives, which means that the boot hard drive has to be installed on the lowest-numbered connection port. Not necessarily number one, but the port with a lower number than any other drives.The two optical CD/DVD drives, the top one of which uses an IDE ribbon cable, are installed in the top bay. The two SATA hard drives are installed in the bay under it. The power supply in this case is located in the bottom left corner. For your information, IDE stands for Integrated Drive Electronics and ATA stands for Advanced Technology Attachment. IDE drives are also known as PATA drives. The P stands for parallel, because the data is transferred in parallel down the 40 wires in the ribbon cable. Note that IDE hard disk and optical disc drives have now largely been replaced by serial ATA (SATA) drives. External hard disk drives (attached from outside the case) that are attached to the desktop or laptop PC via USB (the most common interface), FireWire and eSATA (external SATA) ports, can be used for additional storage, but should not be used as the main source of disk space, even though it is possible to do so, because of problems that can occur with the device driver software. An SSD drive uses much less power than a conventional hard drive, and it can withstand shocks (when a laptop is dropped, etc. ), far better than conventional hard drives. In the near future, as the prices of flash memory and flash-memory devices reduces compared to the prices of current means of data storage, it is likely that all PCs for home use will use flash memory instead of RAM memory, and SSD drives instead of hard disk drives. Note that you may need a BIOS/UEFI update in order to be able to use an SSD if it is to function correctly without RAM memory corruption issues. An SSD should only be used with Windows 7/8.1/10 which are optimised for their use. The BIOS/UEFI often has to be updated to use new hardware, especially on elderly computers. Someone who installed a Samsung 840 EVO 120GB 2.5-inch Basic SATA Solid State Drive (click the link to go to the reviews on Amazon) in an elderly desktop PC, wrote the following in his review of the product [translated by me]: “Remember to set your BIOS to AHCI – not IDE – before installing the drive. Upgrade the BIOS, if an update is available that provides the AHCI setting, before you install the drive if the AHCI setting is not there. AHCI is not essential but it will make the drive a lot faster. Once installed, do not defragment the drive. The Windows disk defragmenter can be disabled in Win7/8, as can system indexing, which is accessed from the Control Panel. Search the web using those key words and your version of Windows to find out how to do both.